Recently, a friend of mine fell overboard – while boarding a boat at the dock! Sound crazy? Not really – when the “victim” isn’t wearing proper shoes… when he stepped on the gunwales and not into the boat… and when the wake of a passing boat (who shouldn’t have been making a wake!) rocked the vessel strongly… In other words, things just go wrong at all the wrong times … Are you ready to deal with it? As a case in point, when I take young boaters out for seamanship exercises, I start the man-over-board drills with an example. I bring the boat up to 20 knots and ask one of the youngsters to throw a fender over board – and then count to 10 before yelling “Man Overboard!” During those ten seconds, two things happen. The fender disappears behind the boat, well over a full football field behind, and the faces of the youngsters turn white and their jaws drop. 2. No sitting on the gunwales – the edge of the boat – even if you are holding on tight. The skipper takes a wake too hard and you are airborne. If you land in the boat, it is a small miracle. If you were sitting on the transom, unless the boat is in reverse, physics demands that you end up in the water. That is if you are lucky enough that the boat is going fast enough for you to land behind the propeller. You could be unlucky enough to land on the prop instead of in the water. You need to do two things. First, attract as much attention as possible as fast as you can. I never go on a boat without a knife, flash light and whistle on my person. The light and the whistle are to attract attention. The knife is to cut me away from the line I am tangled in that is dragging me below the water. Secondly, if the boat continues to steam way, start saving yourself – and that starts with conserving energy and heat. Eventually, someone will start to look for you. Don’t panic and waste life-sustaining energy. Assume the HELP position or at least float with your arms across your chest and your legs crossed. If you slip below the water, don’t thrash and waste energy. Lie there for a few seconds and then dog paddle up. Get back in the prone position and start over. If the water isn’t too cold, you can do this for hours. 1. The first person who sees someone fall overboard does two things simultaneously. First, shouts at the top of his lungs “MAN OVERBOARD” and, second, NEVER takes his eyes off the person in the water and points at him constantly. I tell my crew, “Even if you have to watch him drown in front of you, never take your eyes off him.” Why? If you lose sight of him, we may never see him again. It is unbelievably difficult to find a head sticking up out of the water. This is why the USCG often sends helicopters first to look for people in the water. 4. Call the USCG and tell the watch stander you have a “man overboard!” Your crewmate may be injured, have swallowed a lungful of water or having a medical emergency (how about a heart attack?) Get the “rescue starts now” clock started ASAP! The USCG will have an ambulance meet you at the dock. Great advice... Especially the NEVER TAKE YOUR EYES OFF THE PERSON rule. Great writeup. I would like to know better what he means by keeping the victim inside the turning radius of the boat. I boat on Long Island Sound and deal with tides. Would I not want to approach the victim so that the tide is pushing him toward the boat? 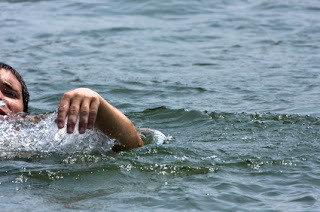 I started man overboard drills whe my older sons were in their mid teens. The first drill I did on a whim. I threw my hat overboard and instructed the boys to save me. It took 20 minutes for them to take me seriously, someone to accept responsibility, and turn the 36' sloop around and save me. That was the first time I was lost at sea, and there were a few others, out of the many man over board drills. Our first drill taught me the the most, ware life jackets, have a clear delineation of authority, and be ready for anything. My sons are quite impressive these days. They often catch my life jacket on its way overboard, ( that still counts in my book ) . out. Capt Clark said the worst thing he could do was tell my Mama. However, the best advice he gave me was; "Remember, the sea does not love you as your Mother does and will demand payment when you can not afford and do not expect it." The event is still remembered til today at 73 yrs old. I ALWAYS put on my PFD before I board and leave it on until I am off the boat!! !